Gilligan’s Island is one of the most loved and popular sitcoms in television history. The show ran for just three seasons and produced 98 episodes, a show-per-season ratio that’s unheard of today when most shows produce no more than 22 episodes a year. On September 26th 1964, Gilligan’s Island debuted on CBS, to almost universal disdain from the critics. 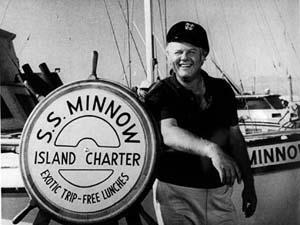 The theme song told the story of the SS Minnow’s Skipper Jonas Grumby (Alan Hale Jr.), his dim-witted first mate Gilligan and their five passengers on an ill-fated three-hour tour off the coast of Hawaii. The passengers included: multi-millionaire Thurston Howell III (Jim Backus) and his wife who was nicknamed “Lovey” (Natalie Schaeffer), movie star Ginger Grant (Tina Louise), high-school Professor Roy Hinkley (Russell Johnson), and Kansas-born Mary Ann Summers (Dawn Wells). The show was envisioned by series creator Sherwood Schwartz as a microcosm of our society with all areas represented within the seven stranded castaways, forced to work together on a deserted isle. The series started with an episode entitled “Two on a Raft” which picked up where the theme song premise left off. After making their passengers as comfortable as possible, the Skipper and Gilligan set sail on a homemade raft in an attempt to find help. They sail for days and endure shark attacks and other mishaps along the way. They finally land on an island and find signs of life and become convinced that there are unfriendly natives nearby. Unknown to them, they have landed back on the same island where they started. The other castaways soon realize there are visitors on the island and believe them to be unfriendly natives as well. Both groups set up traps in a nearby cave and end up trapping each other by the time they realize what has happened. A typical set of circumstances for the castaways and just a taste of the silliness yet to come. This was not however the first show that creator Sherwood Schwartz wanted to air. The pilot episode, which had been partially reshot since it’s presentation to the network, told the story of how the ship came to be shipwrecked and established the characters and their trademark personalities. CBS didn’t consult Sherwood and opted to air what he’d intended as the second episode. Not wanting to waste the footage, Sherwood wrote additional scenes and the pilot footage was incorporated into the twelfth episode, a Christmas show in which the castaways recall the start of their adventure. That was how it began but how did this show end? It was popular in the ratings and had been renewed for a fourth season. What happened? Were the castaways ever rescued? Sit right back and stay tuned. The island in the opening shot is Palmyra Atoll, approx. 1,000 south of Hawaii. You can find it on GoogleEarth. In the past, screw-driven “Steam Ships” carried the prefix “SS”. That type of ship is no longer built, but the prefix is still used by “Sailing Ships”.